The NZCF’s Leadership program incorporates some of the basic skills that most people would learn on a basic management course. It can be divided up into two basic levels, Junior and Senior Leadership. There is an an additional level for those cadets wishing to become officers. Training starts at a basic level at the cadet unit. In conjunction with other team building exercises, cadets get a basic grasp of leading small groups. Cadets that show leadership ability then have the option to apply for the leadership courses. On a Junior Leaders Course, cadets learn the basic theories of leading small groups, showing people how to complete a task and how command structures work within the Cadet Forces. On a Senior Leaders Course, cadets expand on the skills learnt on a Junior Leaders course but to a more advanced level. Cadets are taught the more advanced techniques of leading small groups and how to teach a full lesson with a lesson plan and training aids. On completion of these courses, cadets are eligible for promotion with the cadet unit. Promotion gives the cadets more responsibility and allows them to put into practice weekly the skills that they have learnt. Cadets are then mentored and coached to improve on their leadership training. 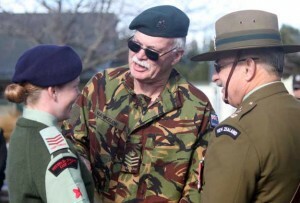 Cadets that are considering carrying on to become officers within the New Zealand Cadet Forces can then go on to attend an ‘Under Officers’ course. This course prepares them for more of the technical and legal aspects of leadership. Cadets who then decide that they do want to be officers then go on to complete an officers Commissioning Course. It is common for senior cadets to also be positions of leadership in other clubs, organisations or prefect positions at school.